When I graduated high school, I delivered the Salutatorian speech and encouraged my classmates to “always look up to the vast wide open sky, the possibilities are endless. You’re not grounded, reach as far as you want. Make it your sky and fly.” I still believe that. Regardless of where you come from, your background should not keep you from obtaining your dreams, fulfilling your potential, and achieving your goals. This, I believe, will build a better and stronger future for everyone. I am a first-generation college student. My parents and my two brothers are my biggest champions – they want to see me achieve and graduate college as the first in my family. My family knows the importance of finishing what we have started. Regardless of the difficulties that we face, or the fear we may have, we try to be persistent, to work hard, and to succeed. My parents brought our family from Mexico to the U.S., because they wanted a safe place to raise their growing family. As a six-year-old, coming to the United States for the first time, I remember everything was different: the streets, the house, the neighbors, the food, the parks, the other kids … even the Saturday morning cartoons. I have always seen America as my home. It’s the only place I know, the only place I have explored, the only place I’ve learned about in detail in history class. I grew up here, I made friendships here, and I have made a name for myself in my hometown of Fort Lupton, Colorado. My home. Teachers, instructors, neighbors and friends, and co-workers taught me to become the person I am today. I was molded by every one of the people that came into my life, each of them adding a different stroke of color into my life. I learned I was undocumented in a particularly awful way, one that I will certainly remember for life. I was attending a Pre-Collegiate Development Program that was sponsored by the University of Colorado at Boulder. I had been part of the program since middle school, had taken special classes and programs, and had decided that I wanted to attend CU. I was accepted into the School of Arts and Science and was excited about my future. Then, I was taken out of a computer class, while in the program, to talk to an Admissions person. He asked if I had a Social Security number. It was then that I called my dad, asking for my number. My father then realized he could not keep my immigration status from me any longer. It was at that time that he told me and my world came crashing down. I was numb, confused, in a state of disbelief. I had worked hard to get to where I wanted. It was within reach and … just like that, it had been taken. I am now studying at Colorado State University and plan to be a dual major in Chemical and Biological Engineering and Biomedical Engineering. After successfully obtaining my degrees, I want to work in a lab researching viruses. My plan is to help communities, not only in America but also the world. I want to provide a voice to those who are scared and to our community that is in fear of what may happen tomorrow. I know that I can give back to my community by leading and setting an example. It’s good for everyone to have DREAMers flourishing and succeeding. 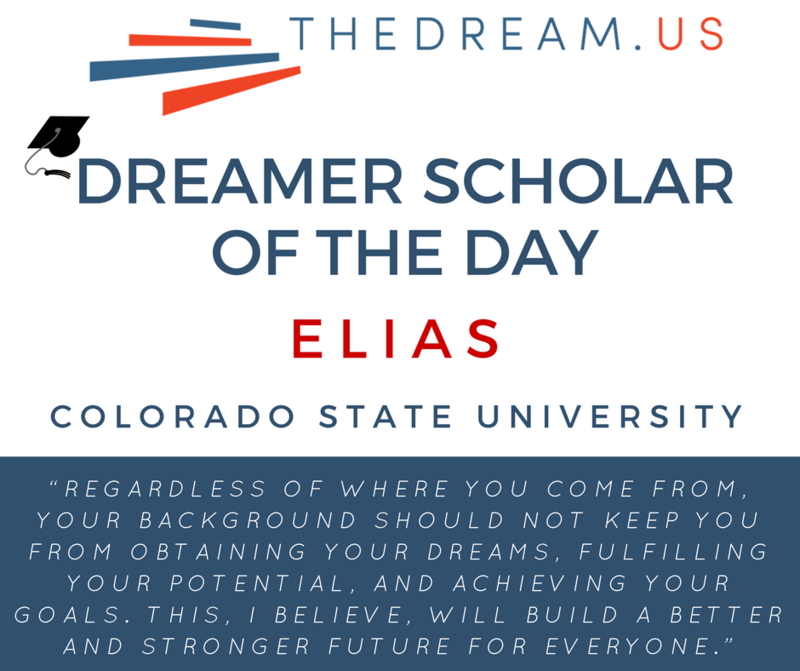 Thanks to TheDream.US scholarship, I have the opportunity to get ahead and fulfill my potential. I wanted to be the first in my family to obtain a college education. I want to use my education to show my worth to the world. My story is still being written, characters still being introduced, plots still being placed. No final details have been considered other than the continuation of my education. I do know that I want to make my parents proud of the child they raised and for whom they sacrificed so much. I am not going to stop.